For all stage-able entities, a Scheduled Changes Module appears on the top of each entity’s page. An entity’s module provides a quick summary of scheduled updates, as well as controls to view, edit and preview individual updates. Use in places where a series of updates needs to be displayed, including a brief summary of their contents. 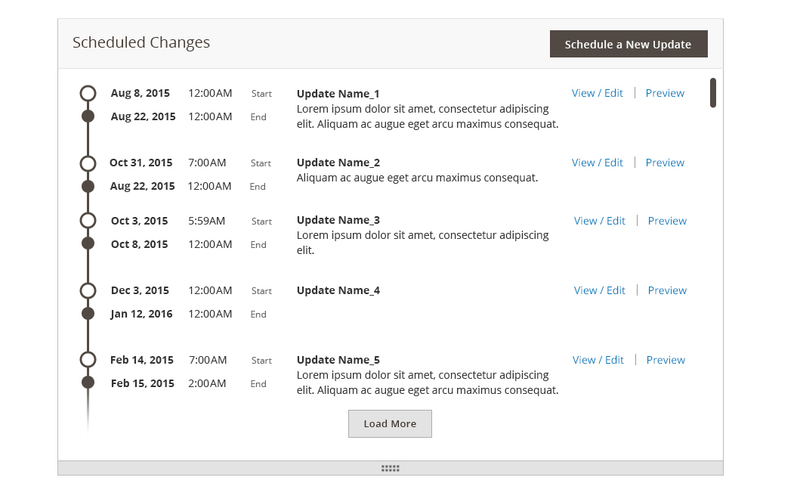 The scheduled changes module, as defined below, should only be used with stage-able entities. When no updates are available to be displayed on the timeline. Shows when several updates are scheduled for a stage-able entity . When a single update is scheduled, the module’s default height is the same as the Multiple Updates View. Users can re-size the module, using the dragger at the bottom of the module. The “Load More” button appears at the bottom of the list of scheduled updates. By default, 5 scheduled updates are displayed. To view more, users can click “Load More” to add the next set of scheduled updates. If you have questions about the Scheduled Update Module, please contact us.